You know about the one in your head, of course, the heart is another, and there’s also one in your gut. This one decides what’s considered food and what isn’t. It knows what you need for nutrition. Your “gut brain” processes the antigens (molecules recognized by your system) and has a memory of what it’s supposed to digest, what should just pass through, and what needs to be destroyed. Problems start when you eat something foreign to your gut. You see, the food industry tells you that processed foods, grain, wheat, and bread are “good” for you. Even the national food pyramid says most of your daily intake should come from grains. But, what the food industry doesn’t know (or doesn’t tell you) is that your gut doesn’t know what to do with the grain products you eat. And sometimes your body rejects them. More and more people are showing signs of intolerance to grains and processed foods. And they all have something in common… gluten. In this month’s Health Confidential, I’m going to tell you how gluten affects your body and what you can do to keep your body strong. Gluten is a sticky, gluey protein found in grains like wheat, barley, rice, and rye. This gooey protein is commonly used in baked goods. Gluten holds on to the carbon dioxide made from yeast and expands. 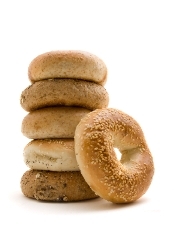 It’s what makes dough stretchy, holds cookies together, makes cake rise, and why bagels are doughy. You can also find gluten in some unlikely places, like pasta, beer, soy sauce, certain medications, toothpaste, and even lipstick. Who Is Affected by Gluten? Gluten intolerance was once very rare. But it’s become much more common in modern times. Sausage: Most brands of sausage use breadcrumbs as fillers. Hamburgers: Bread or wheat products are often mixed in for texture. Ketchup, Ice Cream, and Mayonnaise: Some brands mix in wheat flour for thickness. Prepackaged Grated Cheese: It’s coated in flour to prevent sticking. Beer and Whiskey: These alcoholic drinks are made from grains. Something has changed in our environment to make gluten intolerance more prevalent. It’s directly related to what we put in our bodies. Gluten isn’t part of our native diet. So it’s natural that our bodies reject it. Your “gut brain” thinks gluten is a foreign substance. It doesn’t know that it’s meant to be a source of nutrition. So, when gluten reaches your gut, it panics. Your gut reacts by sending antibodies to attack the unknown substance. This causes your immune system to become hyper alert with auto-immune components. And it can cause your body to attack its own tissue. When your immune system attacks, it damages the villi (small “fingers” in your small intestine that absorb nutrients from your food), so they can’t absorb what your body needs to live. This can cause your body to destroy its own tissues and shut down. Leaky gut syndrome, malabsorption, and malnutrition are some common outcomes. The longer gluten intolerance is left untreated, the worse the outcome can be. Unfortunately, it’s one of the most misdiagnosed conditions out there. The symptoms are very similar to other digestive problems like irritable bowel syndrome and vary from patient to patient. Although gluten-free diets are prescribed to people who are gluten intolerant, everyone can benefit from eating less grains and processed food. When you cut out grains and processed foods, you’re getting back to your native way of eating. This will boost your energy, improve focus, improve digestion, and aid with the absorption of nutrients. Remember, gluten is found in wheat, rye, barley, bran, wheat germ, buckwheat, millet, and other grains. If you see ANY reference to these types of grains on a food label, steer clear. Many food manufacturers now put “gluten-free” on their packaging. Coconut flour and almond flour are excellent choices. If you can’t find these, rice flour makes a good gluten-free alternative. 1Freeman HJ. “Adult celiac disease and its malignant complications.” Gut Liver 2009. 3(4):237-46. 2 Addolorato G, Di Giuda D, De Rossi G, et al. “Regional cerebral hypoperfusion in patients with celiac disease.” Am J Med 2004. 116(5):312-7. 3 Eid WE. “Osteodystrophy in celiac disease: ultimate complications and possible treatment.” S D Med 2009. 62(11):429-31. 4 Molteni N, Bardella MT, Bianchi PA. “Stetric and gynecological problems in women with untreated celiac sprue.” J Clin Gastroenterol 1990. 12(1):37-9. 5 Pellicano R, Astegiano M, Bruno M, Fagoonee S, Rizzetto M. “Men and celiac disease: association with unexplained infertility.” Minerva Med 2007. 98(3):217-9. 6 Farthing MJ, Rees LH, Dawson AM. “Male gonadal function in coeliac disease: III. Pituitary regulation.” Clin Endocrinol (Oxf). 19(6):661-71.